Singapore is a wonderful, colorful cultural melting pot... remarkable in its embrace of racial and religious differences. It is extremely modern in many ways and yet sticklers for tradition at the same time. While most Singaporeans are generally easy-going and accomodating, I found myself being very careful of my words and actions for fear of giving offence. It was also a bit disconcerting to realize that I didn't even know where to buy my groceries (at reasonable prices). 2. Street Directory (http://www.streetdirectory.com/). Coming from a city where street names change with every change in political administration, it was a relief to come across Mighty Minds' userfriendly street directory and bus guide. Need to find out how to get to Ikea using public transportation? Just go to http://www.streetdirectory.com/travel/, type in the starting address & ending address and click enter. 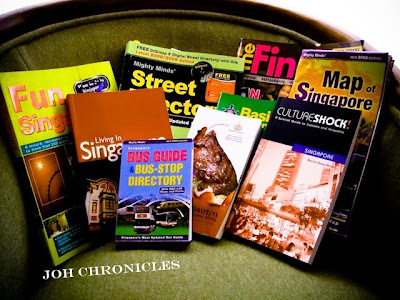 Streetdirectory will generate a bus/mrt guide, including the address of the nearest bus stop. Bring the handy Bus Guide with you to keep track of the stops before your destination. Left it at home? Each bus stop has a list of buses plying that particular route along with the addresses of the remaining stops. 3. Fun Singapore. This is a great book geared for locals, foreigners, tourist and intrepid explorers. It features more than 250 places ranging from farms to parks to places of worship, places of interest & special sports. What I love about it is that the discovery guide not only contains useful snippets of information, it also provides easy instructions on getting there.... very useful when taking a cab or bus to relatively unknown places such as Forest Adventure at Bedok Reservoir Park.